Today’s number to beat was 23 minutes to the 800 foot viewpoint. With wet snow on the trail, I decided I should probably wear boots rather than the lighter (flat bottomed) shoes I prefer. Rowan kept us on a reasonable pace, but I still was suffering more than I expected for much of the way. I imagine it was a combination of the heavier footwear and the increased difficulty of walking through snow. Despite my struggle, we did make our target, arriving to the viewpoint with about 30 seconds to spare. Conditions were not inspiring to stay for too long, but we did rest for a bit and catch our breath before heading down. I took a moment to document some deer tracks along the trail on the way down. 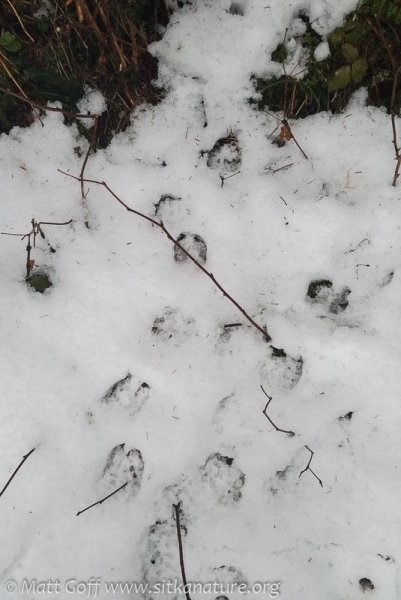 While there were not tons of tracks, it did appear that multiple deer were using different sections of the trail.